Teased as part of the company’s 40th anniversary, the shrouded gadget definitely doesn’t look like a NEO-GEO, or even a NEO-GEO Pocket. Gizmodo notes that the description mentions a “new game machine,” but no details beyond that. The tall, boxy outline suggests a small arcade cabinet, and the slab in front of it looks a lot like an arcade controller. It wouldn’t be a particularly original creation — there are dozens of tiny arcade cabinets with built-in games, but the truth is, none of them is particularly good. They’re novelties, perfectly fun for a laugh, but the hardware — compared with the impressive solidity of real arcade controllers and the NEO-GEO’s itself — just isn’t there. If I had to guess, I’d say this is an arcade cabinet-style console with improved internals, a decent screen to accommodate games newer than 1996 and a separate, perhaps even wireless arcade controller. Price… I’d put it at $200 or $250. Extra controller (and you’ll want it), my guess is $60. I could easily be way off, though. Maybe they’d even let us plug in our old Tanksticks? 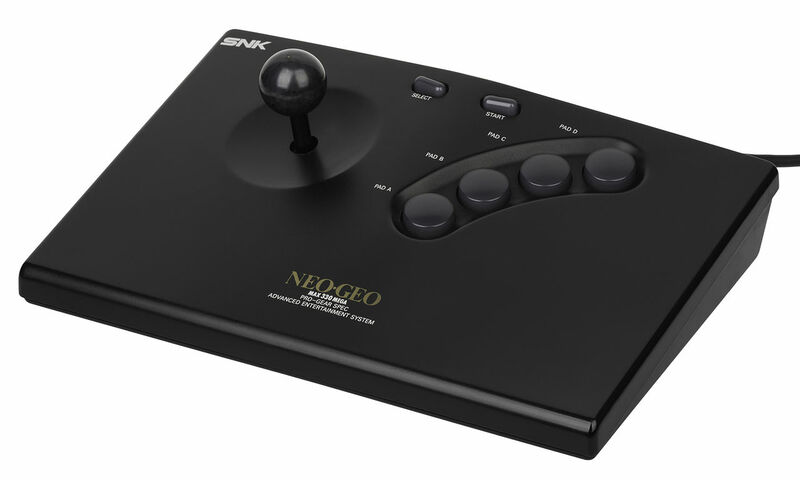 An original NEO-GEO controller. You can feel the sturdiness from where you sit. Inside, you’ll probably find a generous helping of SNK classics, likely limited to arcade and NEO-GEO titles. Even without SNK’s classic games for home consoles like the NES, my eyes were watering as I scrolled down the list of games the company has put out and which may end up on this device. King of the Monsters 2? Last Resort? Twinkle Star Sprites? King of Fighters, Samurai Shodown and all the other fighters? Not to mention Metal Slug and its sequels. The amount of quarters I’ve sunk into these fantastic, beautiful games is uncountable. If SNK is smart, they’ll make it possible to add new games to the system, too. There are plenty to choose from, as the company catered to a number of niches. Having them available for a few bucks each would be a dream — and anyway, if this isn’t a possibility, people will just hack new ROMs onto the system. Whatever the case is, you can be sure I’m already jockeying for position to review the thing. I’ll let you know the second I hear anything.